I first designed Lori's business cards, which then became the basis for the web design. We used turquoise and brown colors (two of her favorites), which add a warmth to the site, and also used stripes in both the masthead and the background, to add some playful design elements. We worked to have the site express the feeling of how Lori works with design, as well as communicate the range of services that she offers. 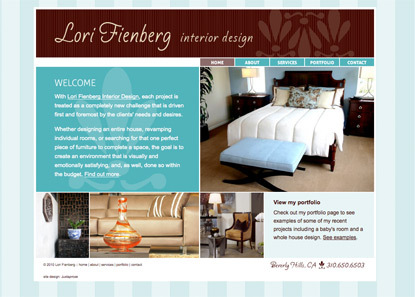 We're excited to see Lori's site online, and look forward to watching her business grow.